The small town of Marzamemi sits at the southeastern-most point of Sicily, and is known for its pretty beach and abundant seafood. 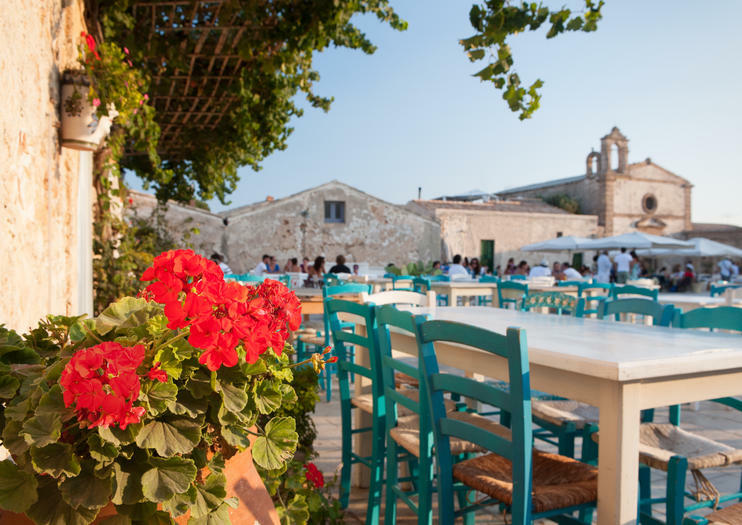 Historically, Marzamemi has long been known as an important seafood processing town. The Arabs who came to Sicily in the 9th century C.E. started some of the first fish processing operations here, and the tuna processing facility that was built in the 16th century – the Tonnara – still stands today. This historic building is no longer used for fish processing, however. Marzamemi still serves as a fish processing center, but the town is far more popular as a summer seaside tourist destination. The small town swells in size during the summer, as visitors flock to the pretty beach and historic center. In addition to the Tonnara and the town's beautiful beach, don't miss the Church of San Francesco di Paola. Marzamemi is not far from Noto, a popular stop along the southeastern coast of Sicily. It's roughly 100 miles south of Taormina, and the best way to get there is by renting your own car or booking a spot on an organized tour – public transportation to Marzamemi is non-existent.